(Nanowerk News) Graphene can come from graphite. But borophene? There’s no such thing as borite. Their results are published in Nature Communications ("Geometric imaging of borophene polymorphs with functionalized probes"). Graphene takes a single form — an array of hexagons, like chicken wire — but perfect borophene is a grid of triangles. However, borophene is a polymorph, a material that can have more than one crystal structure. 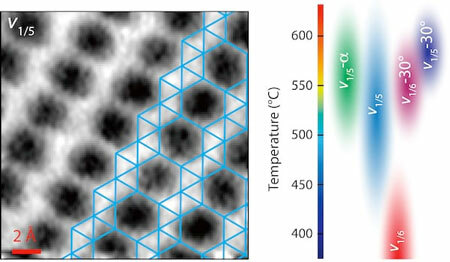 Vacancies that leave patterns of “hollow hexagons” in a borophene lattice determine its physical and electrical properties.